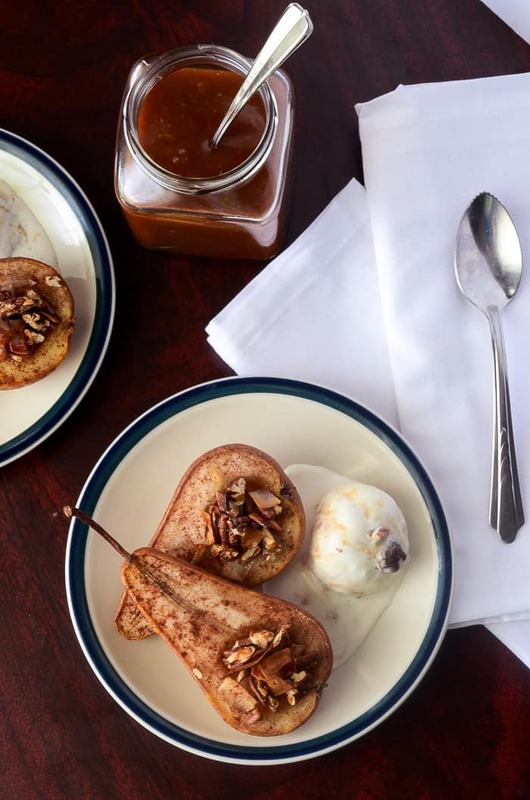 These delicious baked pears will warm you from top to bottom, and can be eaten as a healthy snack, or treated as a decadent dessert with the addition of a generous caramel drizzle and a scoop of your favorite ice cream. Guys. I really intended for this to be a purely wholesome, healthy dessert recipe. And it is!! Before you add the caramel. And the scoop (or two) of ice cream. These babies are wonderful straight out of the oven, and are indeed a healthy paleo, gluten-free, vegan treat that you could feel guilt-free eating. BUT. 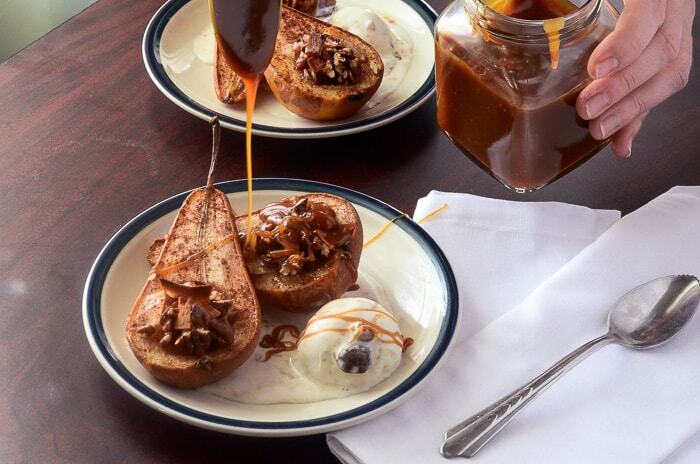 I didn’t name them Caramel Coconut Pecan Baked Pears for nothing. So, I found myself at the Farmer’s Market last weekend, alone. Well, almost alone. I brought the pooch with me. He’s never too happy when I leave him in the car, though. It’s bad enough when I go grocery shopping by myself, but wow, never trust me to go alone to a place full of fresh fruits and veggies. Fifty bucks later, and I was strolling back to the car, hands full of flimsy plastic bags full of healthy, nutritious, potential blog fodder. Included in my ridiculously expensive yet plentiful purchases was a bag of gorgeous organic (!) pears, which I was super pumped about. Pear season is pretty much over, or so I’d thought, so I giddily bought them with the intention of just devouring them one by one, likely depleting the bag by the end of the week. I love me some pears. And yet, here we are, a week later, and check out this recipe. You know how you buy stuff and shove it in the crisper drawers in your refrigerator, and then you forget about it? Yeah. These poor little guys fell in the fridge black hole. On my days off of work, I usually plan out a schedule in the kitchen. I try to stay organized, and have my recipes planned out and prepped, so I can get started early to cram as much in to the day as possible. Natural light is my BFF for food photography, and the sun leaves my living room around 5pm. I’m still working on learning how to be friends with softboxes and umbrellas, which makes for really early days for me. Luckily, thanks to years of waking up at 5am, I’ve forgotten how to sleep in. The morning these lovely baked pears came to life, I was pretty poorly prepared. As a matter of fact, only one recipe on my to-do list actually got done. Everything else came together on a whim. I went through the fridge and pulled out the Farmer’s Market items that remained, that desperately needed love before finding a new home in the trash can. Blueberries, some grapefruit, a handful of strawberries, green beans, and these pretty pears, of which only one had been eaten. I’ve been meaning to share more health-oriented recipes, since I’ve been going back to the gym three times a week, and generally eating a better diet in preparation for the big, coming soon life change that is pregnancy. Clearly, by scrolling back through January’s posts, I haven’t been terribly successful in doing that. 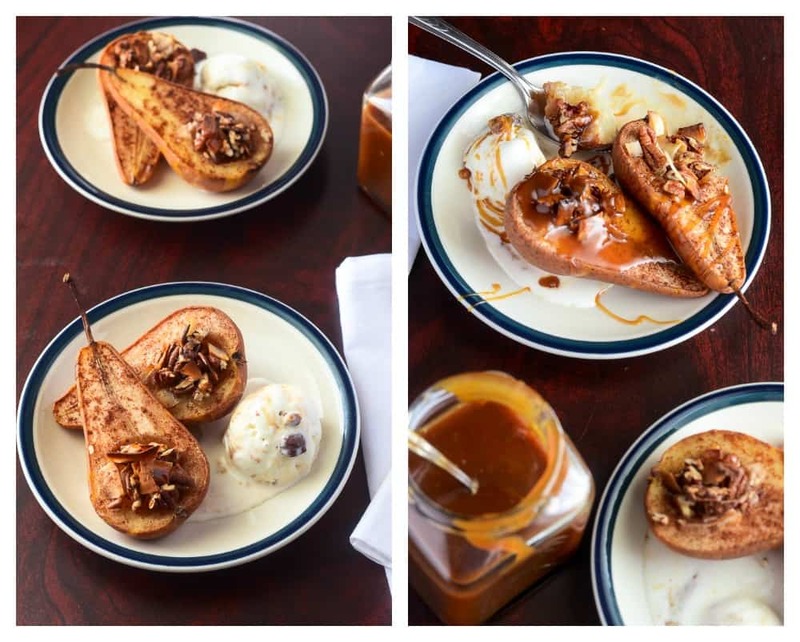 So, my intentions with these baked pears were good…it’s just the junk food junkie in me was screaming to trash them up, à la mode style! I think I can at least count this in the healthy category for the mere fact that the caramel sauce is optional! And the ice cream can easily be replaced with Greek yogurt, and it will still be just as good, only in a different way. 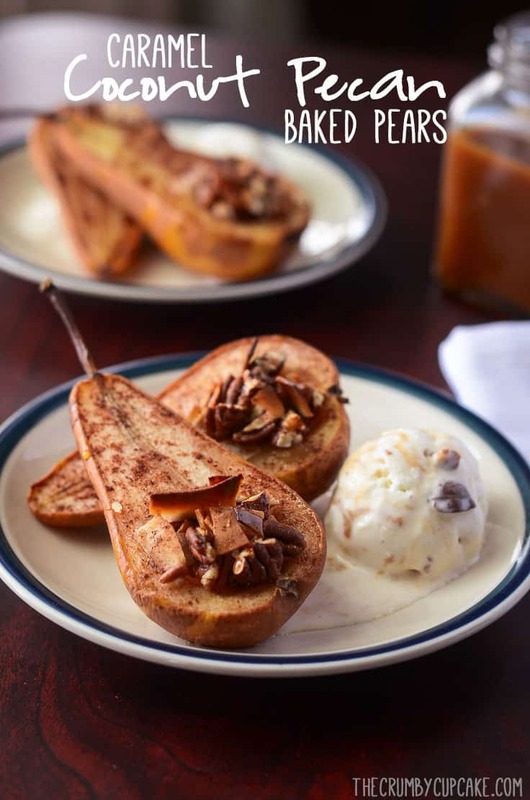 The pears themselves are sweetened with honey, spiced up with cinnamon and ginger, and dressed with pecans and coconut, so you can rest easy knowing you’re eating well when you eat these. But, just in case you’re looking to indulge, or it’s your cheat day, or you’ve got a bag of overripe pears in your fridge, then by all means…I mean seriously. Just look at that melty, caramel mess. SO GOOD. Rinse and half each pear and, using a teaspoon, scoop out the seeded section. Place pears on baking sheet. Combine pecans and coconut chips in a small bowl and stir until combined. 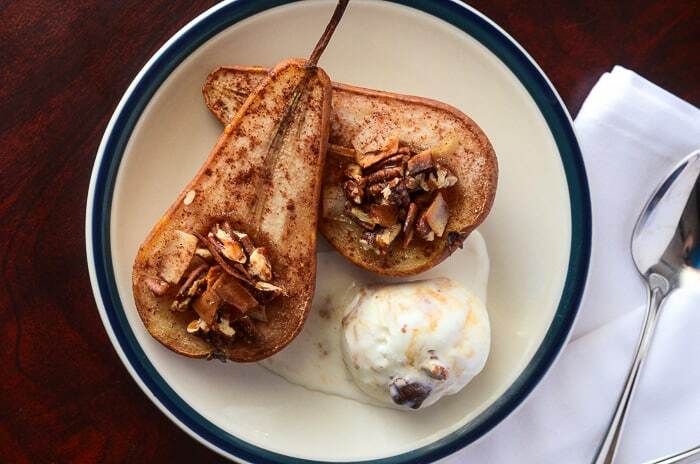 Fill scooped section of each pear half with coconut-pecan mixture, then drizzle with desired amount of honey. Sprinkle on cinnamon and ginger. Bake pears for 25 minutes, or until they are easily pierced with a fork. 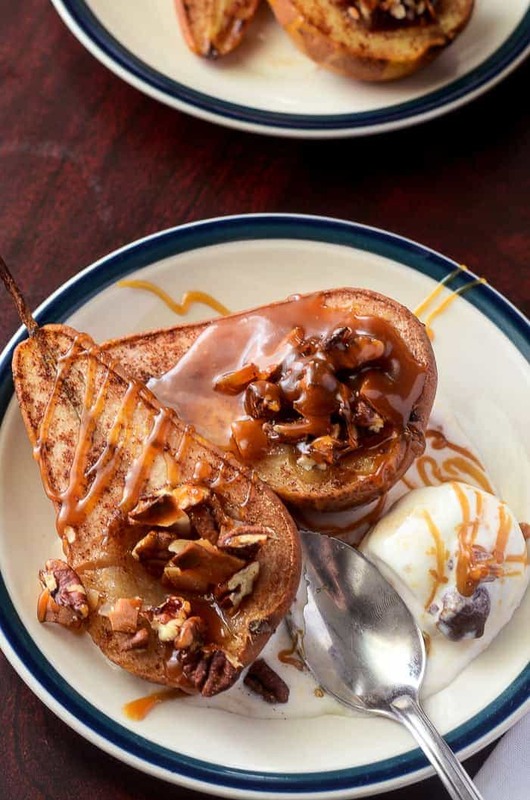 Serve with Greek yogurt for a healthy dessert, or with caramel sauce drizzle and a scoop of ice cream for a more indulgent treat. How do you like to indulge? 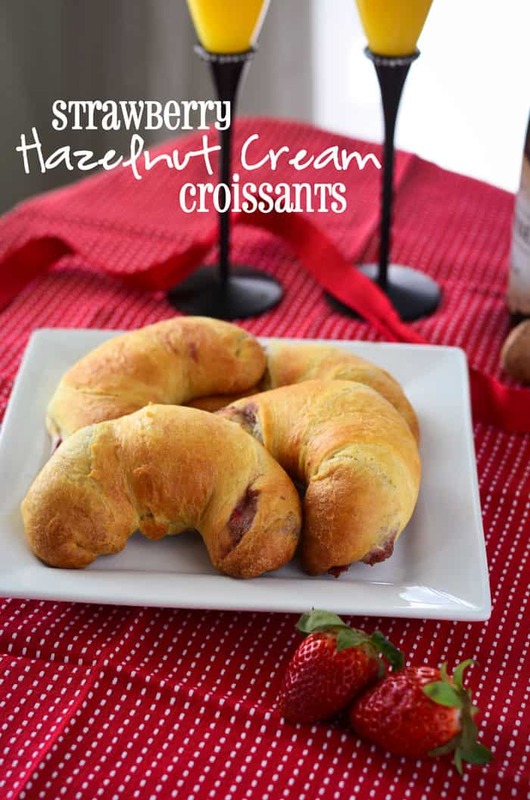 Speaking of indulging, if you’re looking for something a little bit less healthy and a lot more buttery, hop on over to My Cooking Spot, where I’m sharing these quick, easy 4 ingredient Strawberry Hazelnut Cream Croissants. Oh so sinful and oh so yummy! In the spirit of full disclosure, this post contains affiliate links, meaning that I may receive commissions if you decide to purchase anything from companies I affiliate with. I only ever recommend products & systems that I use and love myself, and my affiliate companies do not monetarily influence anything I post about. I’m pretty much dying! These look SO yummy!!! Yum! That looks delicious! We love pears and go through a ton of them. I’ll have to give this a try! this is truly truly amazing!!! These look really good for sure. Thank you for sharing this recipe with us. This actually sounds really good and I’m not a pear lover. I always think of pears as such an elegant fruit and you’ve really dressed them up here! They are simply beautiful and would make a perfect dessert for a romantic dinner for 2. Yum. Those look amazing! thanks for sharing your recipe! I just finished our Pizza Party and am super full but after looking at this I really want some dessert! This looks so tasty! Looks like a great healthy snack & looks so yummy & delicious too. The pictures are really inviting. Thanks for the detailed instructions along with the ingredients for this amazing recipe. SOOOO YUMMY! I pinned this for later! 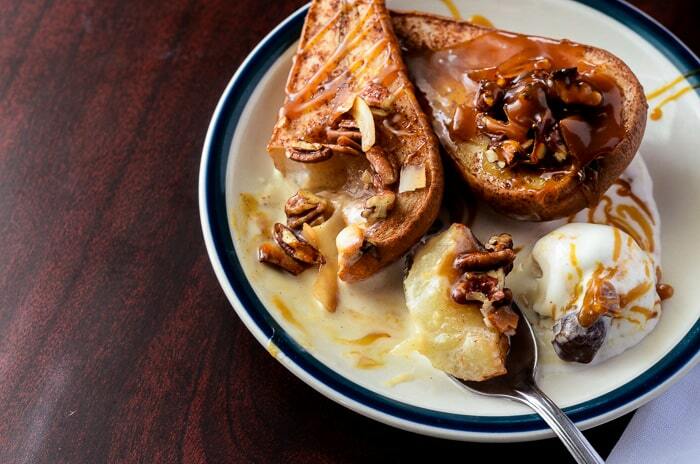 You had me at Carmel, Coconut, Pecan….that’s my favorite combo!! Can’t wait to try these!! These look SOOO heavenly! I cant wait to try them.